Play/Ante game You’re playing against the dealer to see who has the highest hand. PairPlus game You are wagering on whether or not you will be dealt a pair or better. Most casinos, including both of Big “M” Casino’s Fort Myers Beach and Myrtle Beach locations, allow you to bet on either of the games. But some casinos require you to make an Ante bet in order to bet the Pair Plus portion of the game. 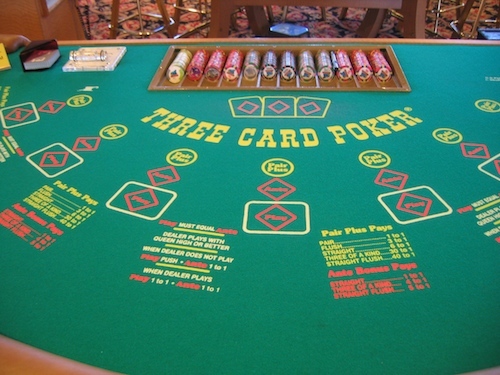 When you sit down to play 3 Card Poker, you will see there are three betting areas in front of each seat. The top betting circle is labeled Pair Plus where the player puts a wager on the pair plus game. Beneath that are two diamonds labeled Ante and Play for the base game. The game starts with the player making a wager in the Pair Plus circle and/or Ante diamond equal to the table minimum. Betting goes clockwise until each player has made their bet. Never bet out of turn. After all the players have made their bets the dealer will give each player a three card hand that is dealt by the Shuffle Master machine. 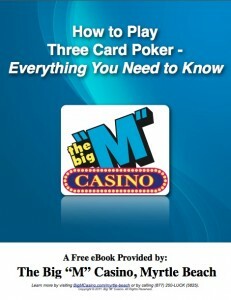 The play begins with the first player to the dealer’s left and continues clockwise around the table. If you’ve placed the Ante wager, you have a choice to either fold or continue in the game by placing a Play wager, equal to the Ante. After all the players have made their decisions, the dealer turns over his or her three-card hand. The dealer’s hand needs to contain a queen or higher to “qualify”. If it does not, then all players who are still active will be paid even money for their Ante wager and their bet on Play will be returned to them. However, if the dealer does have a queen or higher, then each player compares their hand to the dealer’s. If your hand beats the dealer, you will be paid even money for your Ante AND Play bets. If the dealer’s hand beats yours, then you will lose both bets. If there is a tie, then the player wins the hand. If you’d like to try out one of our other table games, we can help you learn to play craps or learn to play roulette, too. 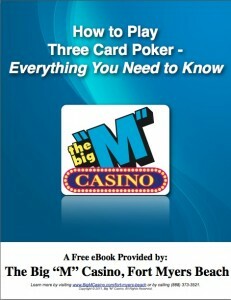 We can’t wait to see you aboard the Big “M” Casino Cruise!